Green Tea caffeine can be very difficult to assign an exact amount to. Like other drinks from cultivated plants (tea, coffee), there are numerous variables that can alter caffeine content. The length of brewing time also affects caffeine content - the longer the brew - the higher the caffeine. The Journal of Food Science evaluated different brands of green tea and had extremely varied results using the same amount of tea leaves brewed for 3 minutes. Some are listed in the table below. As you can see from the above data, green tea caffeine can vary greatly among brands and the type of green tea used. Another study compared the content of dry matter from tea leaves and found Green Tea had 10-20mg per 1 gram dried matter. Black Tea had 22-28mg per 1 gram dried matter. So as a general rule, Green Tea has less caffeine than Black Tea but can vary depending on which brand/type chosen. Click here to find out how much green tea it would take to overdose from the caffeine. Yet another study (here) showed that Green Tea (in Japan) has 30mg caffeine per 200ml cup. The figure we have included in our caffeine database is an average amount. 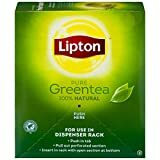 Tea makers Lipton list a figure of 35mg caffeine for their 100% Green Tea. They claim this is from 1 to 2.5 minutes of brewing (see source below) but this is very different than what the Journal of Food Science found. Green tea is also high in the amino acid L-theanine. This has a calming effect and aids with concentration. There's a myth that green tea has more caffeine than coffee, but this isn't true. L-theanine is most likely responsible for this. People will have a different level of alertness when drinking green tea which people mistake for the caffeine's effect when it is really the effect of L-theanine. Matcha green tea can have more caffeine because of the unique way it is made. 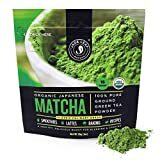 You can find the caffeine content of Matcha here. Tea (Green) contains 3.12 mgs of caffeine per fluid ounce (10.57mg/100 ml).